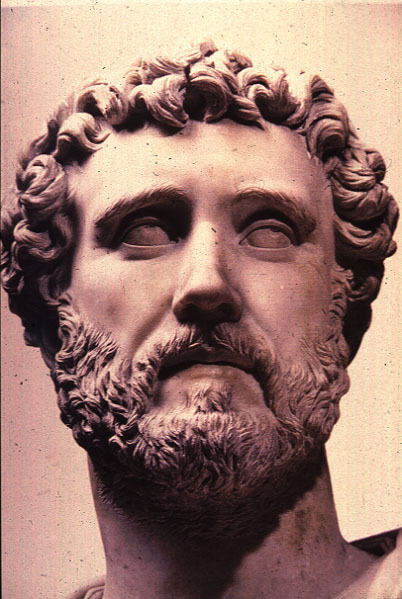 Antoninus Pius is regarded as one of the "Five Good Emperors" in Roman history. He was born in 86 AD. Around 133-136, he served in Asia as proconsul, and there he earned the respect of Emperor Hadrian. After Hadrian's return from the Jewish war, Antoninus was made a member of his council not only on grounds of friendships and family connection, but because of his experience as a jurist and administrator. After the sudden death of L. Aelius Caesar, Antoninus was officially adopted by Hadrian on February 25, 138 as successor to the throne. After administering the imperial offices, Hadrian died and Antoninus became emperor. Antoninus married Faustina and they had four children: two sons and two daughters. However, only one daughter was alive at the time of his adoption by Hadrian. Later, he adopted Marcus Aurelius, who was to be the successor to his throne. In 139, he gave to Marcus the name of Caesar and made him consul designate. In 146, Aurelius was recognized as Antoninus's colleague in rule, and the hopes of Rome and the fortunes of the dynasty rested upon him. Antoninus restored the status of the senate without losing any of the imperial powers, improved and strengthen the great bureaucratic machinery of the Empire and was a great builder, especially in Italy. The whole world pressed on Antoninus with demands and petitions of every kind, and there was clear evidence that he satisfied many of them. Cities like Rome, and Ostia, Lanuvium and Tarquinii, Lorium and Caieta, Antinum and Terraccina, Capua and Puteoli and other places in Campania or South Italy, all owed buildings to him. He induced the rich to make benefactions, but he was also generous with his own resources. Antoninus believed the Empire needed no further conquests. He decided between claimants to the throne of the Bosporan realm whose king was 'Amicus Caesaris et Populi Romani', and supported the people of Olbia against the Scythians. As Hadrian threw himself into the task and built up the basis from which the distant influence could be exerted, Antoninus used up and did not add to the Empire's reserves. While he sought peace, he justified it with the plea of Scipio and Augustus that he would rather save the life of one citizen than slay a thousand enemies. People looked in vain for creative ideas during this quarter of a century of Antoninus's governing. After a short illness he died in peace, at Lorium on March 7, 161. The reign of Antoninus was a period of peace and calm. He was an incredible administrator in his time, thus creating an era of prosperity. Marble Portrait of Antoninus Pius from Baiae, Italy - circa A D 138-161.